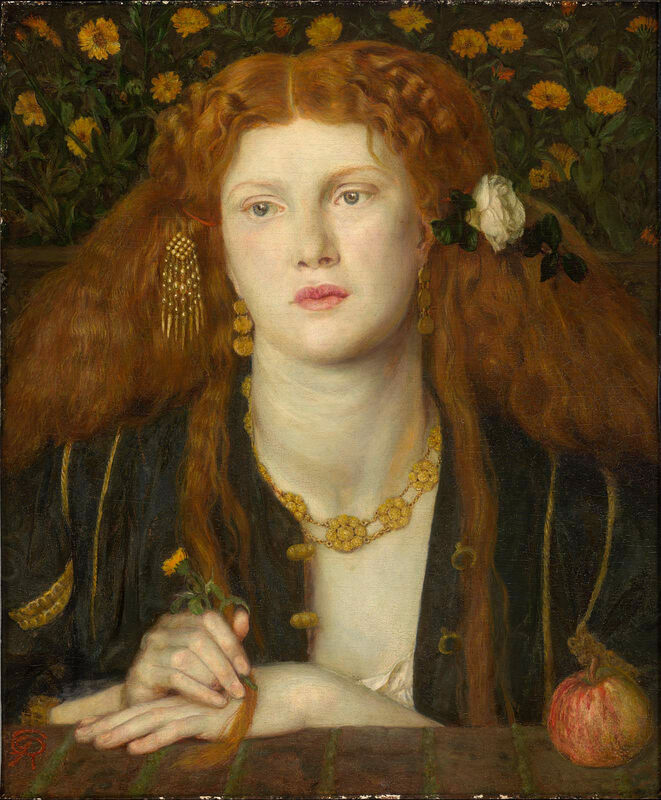 Rossetti here depicts his mistress, Fanny Cornforth, gazing at the viewer or perhaps at her own reflection in a mirror. The sensual sitter represents an idealized beauty, while the artist’s use of luxurious decorative elements invites sheer visual enjoyment. Inscribed on the back of this panel is a line from a sonnet by the fourteenth-century Italian writer Giovanni Boccaccio: “Bocca baciate non perda ventura, anzi rinova come fa la luna” (The mouth that has been kissed loses not its freshness; still it renews itself even as does the moon). Boyce, an architect, painter, and founding member of the Pre-Raphaelite society, was also a close friend and patron of Rossetti. He commissioned this painting from Rossetti on July 23, 1859 and it was completed on October 13. He lent it to the "Exhibition of Old Masters," Royal Academy, London, 1883, cat. no. 309. The name of the buyer is recorded by Algernon Graves, "Art Sales," vol. 3 (London, 1921), p. 104. He may have been an agent for Agnew or Murray. Charles Fairfax Murray was a partner with Agnew and purchased paintings for the firm. According to Barbara Bryant, in "The Age of Rossetti, Burne-Jones, & Watts: Symbolism in Britain, 1860-1910" (exh. cat., Tate Gallery, London 1997), p. 96, cat. no. 2, the painting was owned jointly by Agnew and Murray until 1897, and Murray sold it to Mrs. Brandegee in 1906.